Naver Papago is a translation app that supports ten languages, including Korean, English, Japanese and Chinese (both Simplified and Traditional). It is designed with distinct colours and a clear structure to differentiate each translation feature, including real-time voice translation, text, conversation and image translation. Its intuitive-to-use interface allows users to access all features easily and quickly. 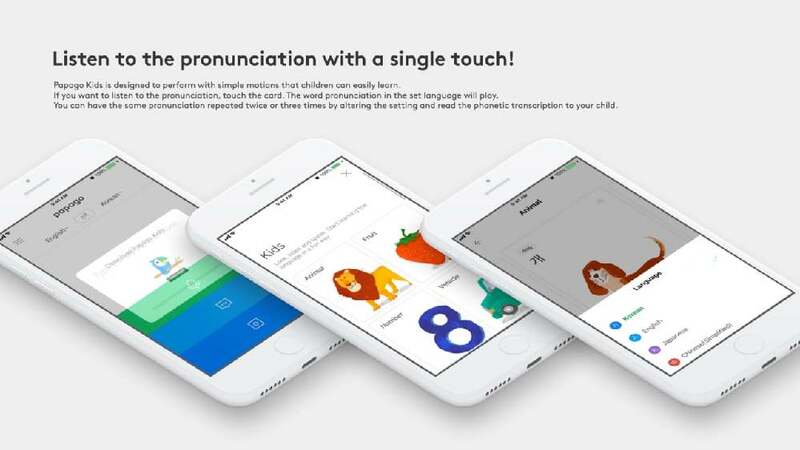 Supplemented by Naver Papago Kids, the app also offers basic vocabulary with appealing illustrations through its simple and appealing user interface, inviting children and basic learners to study the language while enjoying interesting contents. Named after the Esperanto words for “parrot” and “having language abilities”, the Naver Papago app also provides easy phrasebooks and a dictionary for a more comprehensive experience, enabling users to obtain deeper information on any given word. Allowing translating language pairs in two directions simultaneously, such as when speaking to a foreigner in one’s mother tongue, as well as translating what is shown on an image or a photo, make this app ideal for travelling, a business trip or just learning a new language for fun. The Naver Papago translation app impresses with a highly aesthetic design that is clear, easy to understand and intuitive to use. Users can quickly and easily find what they need among the numerous services and covered languages. It allows for manual and voice input simultaneously, thus offering a playful approach that is not only perfectly suitable for travelling, but also great fun to use.